The HuCAL® antibody generation process can be tailored to increase the likelihood of selecting antibodies suitable for use in flow cytometry. As a first step the primary screening of antibodies selected from the library panning can be carried out on antigen-expressing cells using flow cytometry, instead of ELISA on immobilized antigens. The high-throughput screening is performed using antibody-containing E. coli lysates in 384-well format. Antibodies that test positive are sequenced, cloned in the chosen Fab antibody format and purified, and can then be confirmed in flow cytometry on the relevant cells. As part of this service, Bio-Rad has the capability to set up multiplex assays enabling the primary screening and final characterization to be performed on several different cell populations in one well. Fluorescence barcoding of the different cell populations makes this possible. The aim of this project was to select Fab antibodies that bind the human protein of interest (POI), and optionally also the mouse homolog of the protein of interest. Screening was carried out on four human cell populations expressing different antigens. The four cell types were distinguished from each other using fluorescence barcoding to enable a multiplex assay. Fluorescence barcoding works by internally labeling eukaryotic cells with decreasing concentrations of Calcein AM (CAM). Non-fluorescent CAM is converted into green-fluorescent calcein after hydrolysis by intracellular esterases. Fig. 1. Fluorescence barcoding of target cells. Discrimination of four different cell populations expressing different antigens by fluorescence barcoding using decreasing concentrations of CAM. The calcein stained cells were added to the 384-well plate, followed by the HuCAL Fab antibodies in E. coli lysate. After incubation and washing, an Alexa 647 conjugated anti-Fab antibody was added, and following further incubation and washing steps, analysis was carried out by simultaneous signal recording in two fluorescence channels: FL1: CAM; FL4: Anti-human Fab:Alexa 647 antibody. The fluorescence barcoding allowed the multiplexing of four cell populations in one well. Fig. 2. Flow cytometry primary screening of cells with HuCAL Fab antibodies. Dark-colored wells represent binding of the antibody candidates to target cells. For this example project a comparison of primary screening by flow cytometry and ELISA was carried out (Figure 3). The small overlap of results underlines the importance of an application-specific screening as this considerably increases the probability to identify antibodies suitable for flow cytometry. Fig. 3. 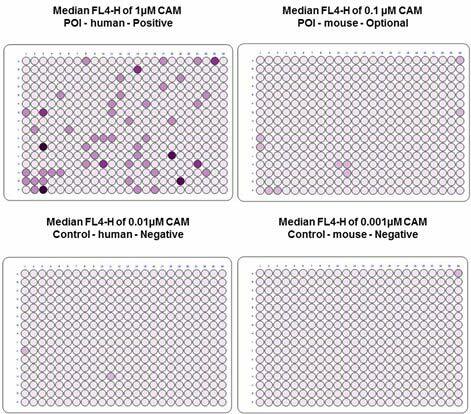 Comparison of flow cytometry and ELISA primary screening results. Top: The flow cytometry screening identified 93 antibody candidates showing binding to cells that express the human POI. Bottom: In the ELISA screening only 15 antibody candidates bound to immobilized POI. 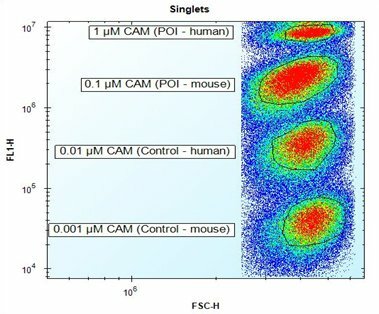 Characterization of purified antibodies was carried out by flow cytometry (Figure 4). 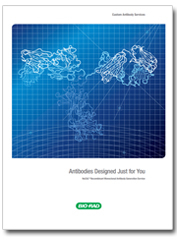 The results demonstrate that antibody 1 recognizes both the human and mouse proteins of interest, whereas antibodies 2 and 3 recognize the human protein only. Fig. 4. Flow cytometry characterization of purified antibodies. Four cell populations expressing different antigens were stained by fluorescence barcoding using decreasing concentrations of CAM. In parallel, cells were incubated with purified Fab antibody against the POI.